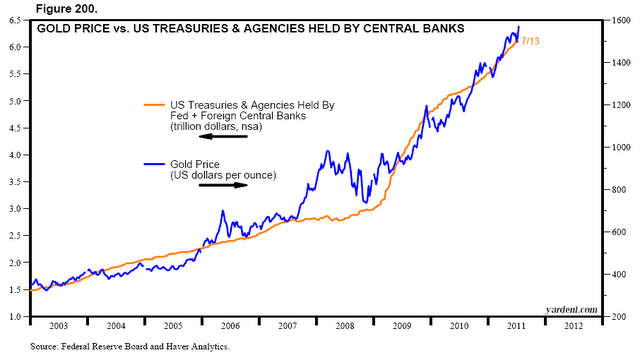 Here's Proof: Global Central Bankers are Driving Up the Price of Gold! A New Gold Conspiracy Theory – or Proof? There is an interesting close correlation between the price of gold and the sum of US Treasuries and Agencies held by the Fed and foreign central banks. This shows that the price goes up as banks monetize the swelling debt of the US government. I’ll say it’s an interesting correlation. Bernanke and central banker cronies print money to buy up Treasury securities, creating inflation and driving up the price of gold! Previous What Would U.S. Default Mean for Canada – and the Global Economy?